Last night we went to a dinner with friends. 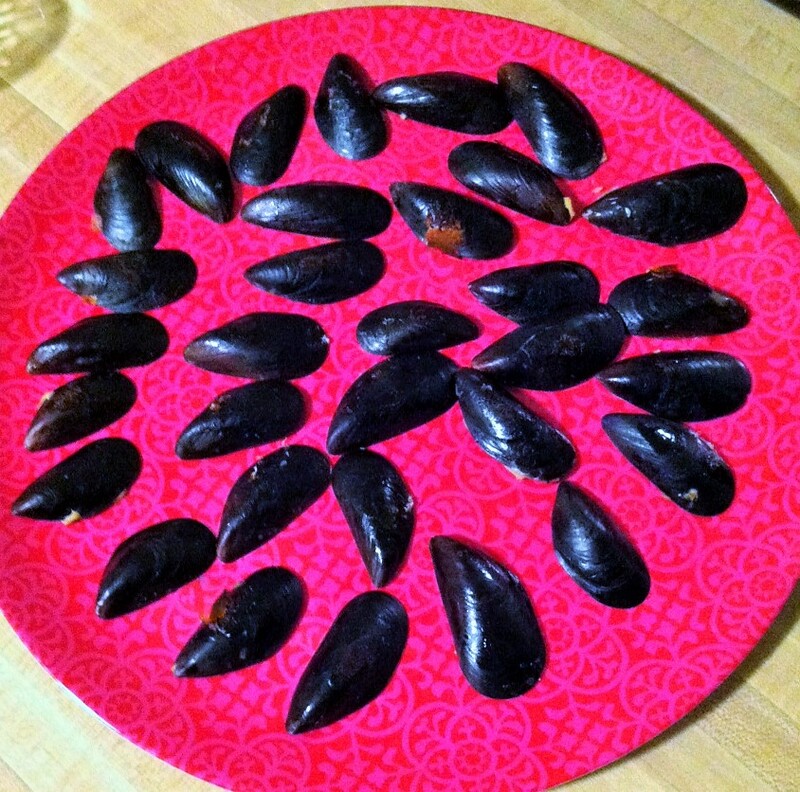 All week I had it in my head that I was going to make stuffed mussels as an appetizer. I figured out how to make them (in my head) just so, they would be filling and easy as a finger food. What I forgot to factor in was two stir crazy kids in the mix while I was trying to prep for this. Yeah, I don’t know why I forgot about this either. This IS a simple dish. And it’s really REALLY delicious. But it was not the easiest to do yesterday. I think a combination of me having a fairly short fuse (see Thursday’s post on sleep or lack there of), Z wanting to help with the mussels, but not wanting her hands to get messy (what!?) and B having his top 2 teeth breaking through so just screaming non-stop. Yay for me! Anyway, cooking mussels is simple. In fact, it’s one of the most delicious simple meals I think you can make. On the east coast we are lucky, mussels are extremely cheap. I’m talking $2/lb at a fish market. I was feeling ambitious and got 3 lbs. (Hindsight has me laughing at myself) First I’ll tell you how to make mussels. Then how to stuff them. You can just take the first recipe, make a couple of sides and eat this as is, or go the extra step for a really wow appetizer. My sister and brother in-law gave us homemade beer for Christmas, we had a couple the other day (they told us to wait a month before drinking) and both thought they would also be excellent with mussels. So yesterday, I broke out the beer. When cooking mussels you need to remember that firstly, the mussels are alive, so some of them may open and close their shell before you start handling them. When you are cleaning them you are checking for mussels that are already open. They are dead and should be discarded. In a large lidded pot, add liquid and butter. Scrub and de-beard your mussels and add to pot. Cover with a lid and turn on to medium-high. Cook for 5 minutes. Most, if not all of your mussels should be open. If any of them are still closed they should be discarded. At this point, you can eat these mussels. They would be fantastic with some frites or sautéed spinach. But I had other plans for these guys. Since we were going to a dinner party, I wanted to make sure these were something that could be eaten easily, and be filling. 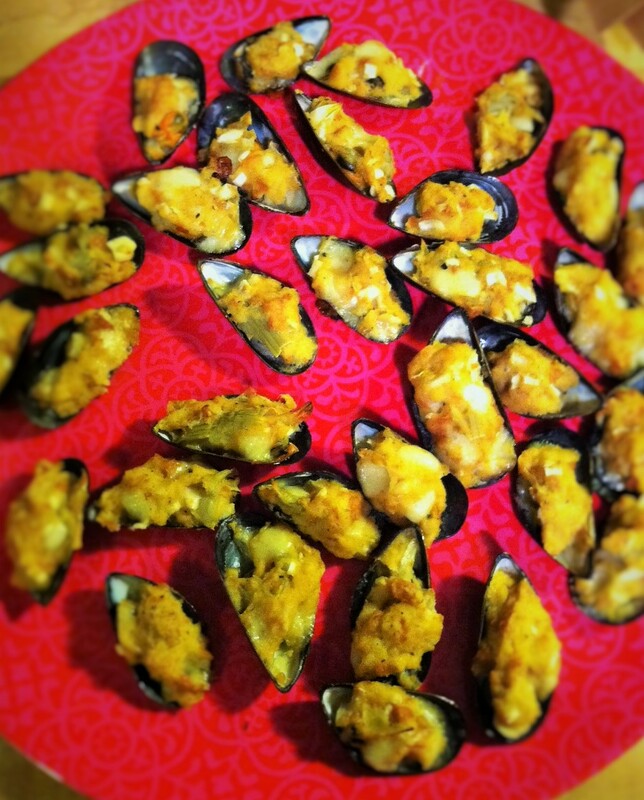 So I made an easy stuffing, and stuffed the cooked mussels. Tear up the buns into little pieces, add to a medium bowl. Add all other ingredients except the cheese. Stir well. The liquid should be soaked up by the bread and form a bready ball (sort of). Add the cheese, stir. Set aside. Next open all the mussels, remove the meat from the shell and place onto the “clean” shell, set aside. Once all mussels have been de-meated (is there a term for this? I have no idea), take each mussel and a bit of the stuffing. Pat the stuffing around the mussel and place back into the shell. Back in the oven for 15 minutes. Serve hot.